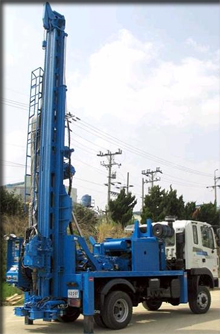 • DESCRIPTION: BHS Make, CDR 400 Core Drilling Rig, Top Drive all Hydraulically Operated Truck mounted Drilling Rig is designed for Core drilling for Geo-technical investigation (Geological survey) applications. Truck Mounted Rig with power drawn from the Truck engine with suitable PTO arrangements. Optional: Separate Deck engine can also be mounted for the power source as per the customer requirement. Stabilizers (Jacks): System consist of four hydraulic leveling jacks with reverse flow restricted valves to ensure safe operation. Two numbers are at the front (operator side) the rig controlled by two separate valves and Two jacks at the rear side of the rig controlled by a single valve. • BHS Drilling Rigs can be supplied in custom-built models in various Configurations as indicated below, Mounting features to suit all special requirements and Teechnical specifications can be offered accordingly. CDR 800, capable of drilling upto 800 Meters both in wireline Q and conventional. CDR 1500, capable of drilling up to 1500 Meters both in wireline Q and conventional.